The last day of April saw the PWT travel down the line to empty the RUDD where it will strengthen the infrastructure and return to fill the RUDD with the material from the relay site. This was transported to the Incline and emptied. The photo shows the area of activity without revealing the peeling paint on the LMSCA container which I am assured will be remedied in the near future! The LMSCA finished the reseating of their Mark 1 SK and the investment is not underestimated together with the efforts to restore the roofs of the EVRA Mark 1 fleet. There was also some unrevealed activity on the Third Open yesterday to manufacture and fit more roof struts. 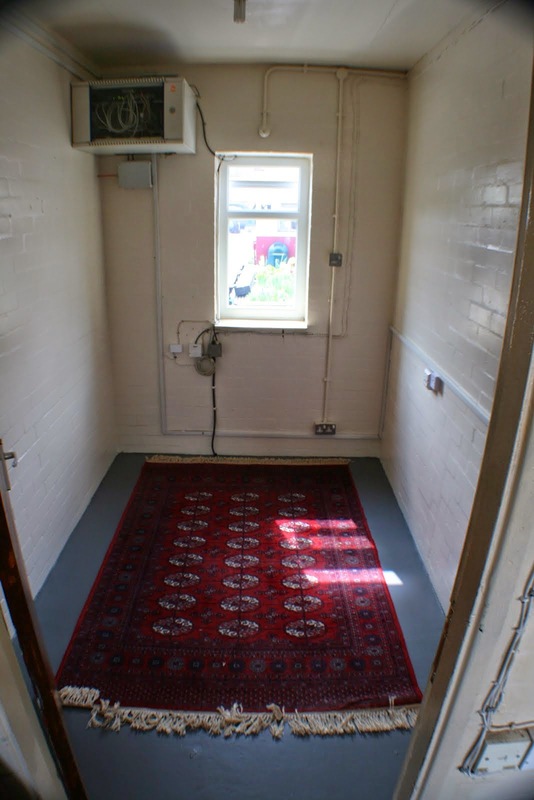 The LCC ( who is able to speak again) together with her assistant tended to Bubble Car 55012 and the Training Room carpet and at Duffield four seats were repainted together with weed treatment of the car park. 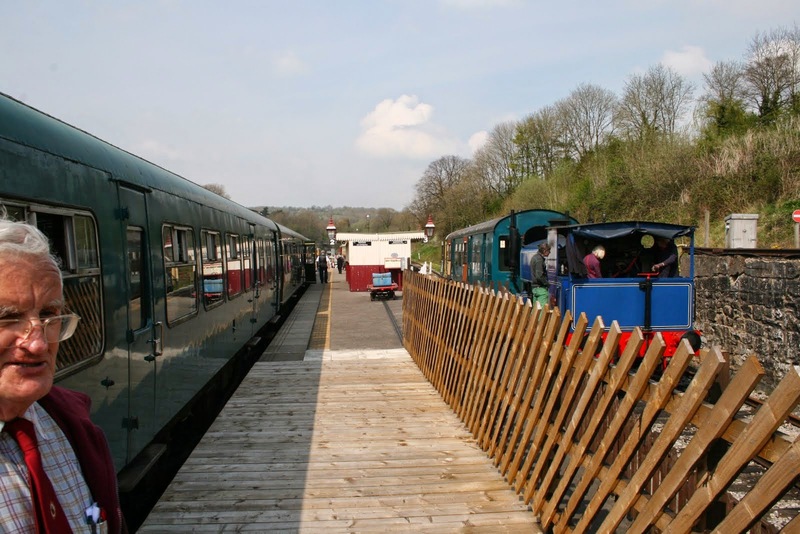 The Booking Hall received a steady stream of enquiries and we welcomed a Silver Drive a Diesel Day reservation. The Pullman Buffet Car welcomed a number of visitors and it was great to see Angela back in the fold. As ever Tuesday was exceptionally busy on many fronts. The photos show the first stage in the grand project to install a crossover north of the former dust dock and the conversion of Phil's former office into the accountancy and catering suite. The PWT were out in force to commence the work needed to prepare Road 1 for the crossover pointwork and I am grateful to Anton for the floorpainting and Eric Hills for the expensive carpet for Angela's new residence. Fred & Iris blessed the Mess Hall with their customary standards of cleanliness and Lesley the Lister was returned to good health through the good offices of Brian Ashley. The VCT continued their purge of vegetation north of the Cemetery Lane bridge with the aid of some shunting performed by the dmu team. Seven men present and two good fires achieved. The LMSCA deviated from their Stanier vehicles to continue with reseating the BR Mark 1 SK and continue with dealing with the roofs of the EVRA Mark 1 vehicles. All this work designed to improve the presentation and appearance of our fleet. The DST laboured on with their efforts on Cathryn including a difficult task of releasing the firebox that seemed reluctant to part from the frames. They did feel at one stage the fitting of a small diesel engine and smoke machine may move the project forward. They also prepared Friday's driver experience locomotive for action. Today's service was quite well supported and my thanks go to the train crews, evra shop, Booking Halls at Wirksworth and Duffield together with the Pullman Buffet Car for making our passengers happy. The 18 customers for our Tea and Train product seem to have had a most enjoyable day. There were also repairs to the display wagon at Ravenstor undertaken. A much more pleasant day than expected and also rather busier than expected. The Duty Station Gardener attempted to weed and infill plants in the quad and other places whilst our visitors admired our selection of prize tulips. Down the yard, the Austerity Team scraped and painted their way through their frames and the DMU Team, newly returned from heathen parts (Norfolk) were all over railcar 50253 like a rash. Work include windows, doors and removing seats from the passenger compartments as a prelude to restoring the floor. Ladies floor (again), the back office floor (again), the Information Room exterior trim, the picnic area fence and a large number of patches in strange and remote places. Please do not touch anything maroon, cream, black, white or grey until tomorrow. A slightly damp day of pottering around with our Driver Experience guests and dealing with the usual selection of routine and bizarre enquiries. Behind the weighbridge the International Vice President of signalling considered many strange and unusual parts. The Station Foremen once again attempted to make a silk purse out of the sows ear that is the back door of the Booking Hall, but with the most extreme reluctance a new door will have to be obtained at long last. The passenger department also applied floor paint to the back office and to the Ladies. Will staff please note that the Ladies will still be wet tomorrow and therefore ladies should be directed to the Extra Ladies. Another day of great activity with our service trains being very well supported with the bonus of a coach group originating in the Selby area. 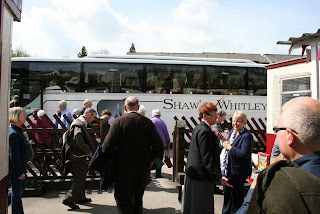 The coach driver turned out to be a volunteer on the North Yorkshire Moors Railway and had a conducted tour of our more modest facilities. The happy customers are pictured returning to their transport for the delights of Matlock Bath. 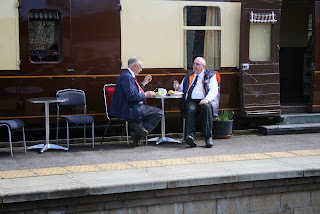 My thanks go to the train crews, EVRA shop, Booking Hall and Pullman Buffet Car who maximised their take from our visitors on what turned out to be warm, sunny day. The PWT achieved the balance of their track patrol between Shottle and Idridgehay together with some vital measurements of where the new crossover is to be positioned north of the "dust dock". Work continued on the ground frames and signalling to be applied at Shottle to enable us to pass trains there in the fullness of time. The dmu team undertook some running maintenance on the two car set that conveyed our coach party prior to its entry into service and then went on to shunt the LMS Third Open to its new resting place and clear the decks for tomorrow's driver experience day. It was good to welcome Ann to the Booking Hall after her many roles with the North Norfolk Railway.Happily, for us, she and her husband have moved from Sheringham to Crich for family reasons and her skills will be pressed into use with our slightly smaller enterprise. A pleasant and rewarding day. Quite a day with Fred & Iris giving the Mess Hall a deep clean to keep all known diseases away from our team and we celebrated the delivery of some £11,000 of permanent way materials that will allow the track work in Wirksworth Yard to be steadily modified over the summer months. This will facilitate the enlargement of the Maintenance Facility next year if we can raise sufficient funds and have a good trading year. My confidence is ordering these materials has been bolstered by a splendid response from our share holders following the appeal sent out with the notice of the upcoming AGM. There was a hand spray weed control treatment to most of the Wirksworth Yard and the Pullman Buffet Car entertained a group of afternoon walkers. The Booking Hall welcomed visitors and continued to take Afternoon Tea bookings. The LMSCA's Third Open emerged in all its glory from the Maintenance Facility and was take to the Hannages for a photo opportunity. Its journey involved all our teams at Wirksworth and I am extremely grateful for their assistance. A dull and initially very wet day that made the heart sink as there was little prospect of passengers but we were pleasantly surprised that our visitors had determination and the services provided by our two "Bubble Cars" were quite well supported. The DST concentrated on maintaining their locomotives after the exertions of the Easter weekend and the need to field one for the experience day on Friday. They also continued with the de-construction of Cathryn's frames and refurbishment of various parts recovered. Mick Billings concentrated on flail maintenance and the other members of the VCT struggled to make a contribution in the atrocious weather conditions. 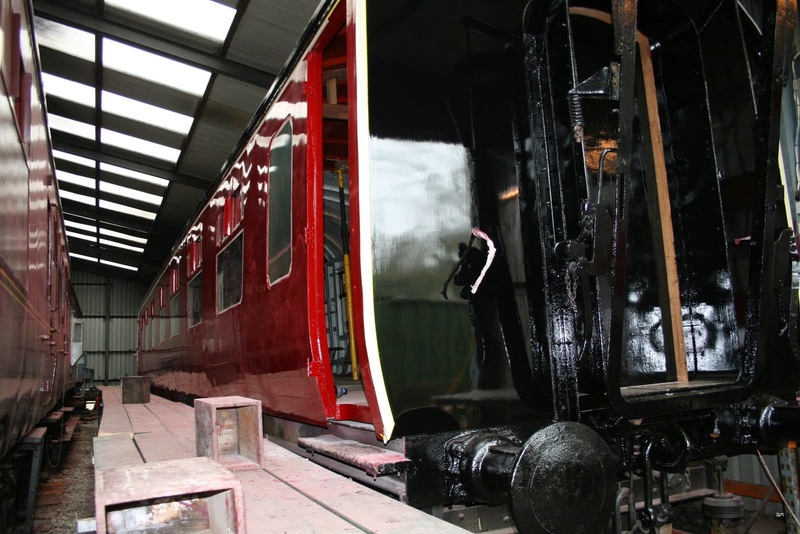 The dmu team concentrated on preparing the bodywork of 50253 for painting and the LMS Brakevan was readied for its new roofing felt. The PWT took the opportunity to undertake track patrols between Duffield and Shottle, Idridgehay and Wirksworth and Wirksworth and Ravenstor leaving the Shottle to Idridgehay section to be dealt with on Thursday. The Pullman Buffet Car scored very high marks today as they served 18 Afternoon Tea customers in the First Open to rave reviews. Two of today's clients were from Montenegro indicating our fame does spread far and wide! The catering team are really getting this adventurously priced product very right. The Booking Hall looked after a steady stream of enquiries together with today's customers and I am grateful to all who delivered today's services in less than kind conditions. A fairly small team turned in today to deliver our Easter Sunday services and I do thank them for ensuring Henry Ellison worked to and from Ravenstor, the three car set undertook the Duffield runs and Leslie the Lister tried to deliver the narrow gauge operations. They were supported by the Booking Halls at Wirksworth and Duffield together with the EVRA shop and the Pullman Buffet Car. Our major star of today and the last two days was Mary who orchestrated the Easter Egg trail through weather that was quite unpleasant at times but her efforts were widely appreciated by our visitors. In the background those of the dmu team that are not cruising on the Norfolk Broads made progress in creating a foot crossing at the entrance of the Maintenance Facility and there was some paint applied to the Wash Green Dock gate in an attempt to make this area a little more presentable. Today's photo shows our two main forms of transport with a part of our key third man, a task that is not widely appreciated but vital to running the Duffield service and the steam team entertaining our visitors. A short video of today's activities is shown and at little more of Italy for those that are interested in such matters! A rather damp and quiet start to the day, but things gradually picked up and the passenger service pottered around. Down the yard, the Austerity Team carried on with their mammoth frame and wheel painting exercise, the EVRA SO received attention and the reduced DMU team carried on with unit 50253. After a quiet start our Duffield service became much busier with good passenger numbers throughout the afternoon and early evening. Number 3 made a welcomed return to the Ravenstor service and proved popular with both our young and older visitors. Following a transmission problem 'Lenny the Lister' sparked into life and provided a narrow gauge service after lunch. The miniature and model railways were not to be out done and these also enjoyed good visitor numbers. The Pullman Buffett coped admirably with the demands of the day. Down the yard the PCLG group attended to the class 33 and Tim Oaks continued to work on 'Duke'. The 8F group carried on with their work on 'Cathryn's' boiler and further DMU related activities took place in the shed. Finally today's source of amusement was the Wirksworth Station Public Address System which intermittently sounded like a constipated Dalek following the installation of an extra speaker by one of our young Sound Engineers. After many attempts to re-balance the system, the Booking Hall team have restored normal communications by temporary disconnecting the offending speaker. An extremely pleasant day for running a railway: we pottered up and down happily with our passengers, and our other visitors sunned themselves around the platform watching the world go by, which is of course, the true and rightful purpose of sitting on a railway station. Down the yard work proceeded on the EVRA SK interior, began on the roof of the EVRA SO, and continued on railcar 50253 which had various trim sanded and painted. Much of the DMU team is going on a short visit to the far end of the world (Norfolk) and I have promised them that we will have finished 50253 for when they get back - consequently a 40 ton truck will arrive on Tuesday with the words "Gaffer Tape" written on it. was shunted into the afternoon sunlight with its painting is now finished. It sat glowing gently outside the shed and once a bit of tweaking is done no doubt a fine picture of it will appear in these renowned annals. I am back amongst you from foreign parts and today saw our planned service work well on quite a dull and cold day. 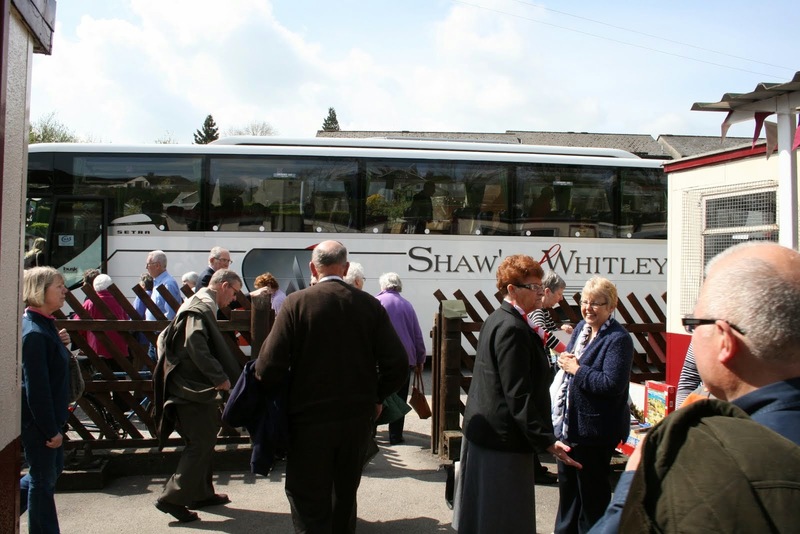 The train crews and EVRA shop looked after our passengers together with the Booking Halls at Wirksworth and Duffield. The Pullman Buffet Car did their best to serve our un-warmed customers producing a satisfactory result. 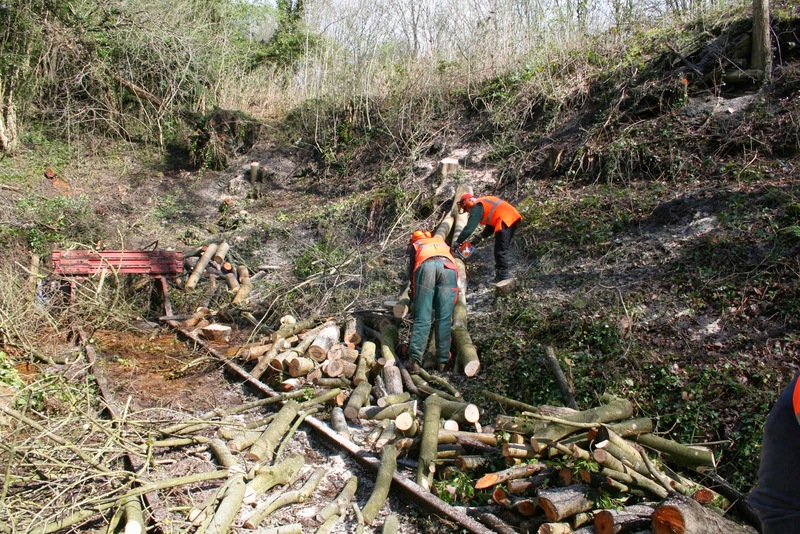 There were also repairs to the water pump in the steam locomotive pit and the VCT effected fence repairs around the "water fall" narrow gauge terminus and dealt with more trees on the east side bank north of Cemetery Lane. The dmu team replaced a defective starter motor on Iris and fuelled all the stock needed to deliver our services over the next five days. The LMSCA continued with the replacement of seats in the Mark 1 SK and applied the final coat of varnish on their Third Open. All in all a good day if you were well wrapped up. PS - as pre-warned there will be elements of our recent holiday to delight you! - http://youtu.be/3BFy0A14RHg - is it a tram or an electric bus or an abomination? Another beautiful day yet again and it really was the calm before the storm, with 6 days of service coming right up! Today, a pass was made at the weeds along the line and the Permanent Way team continued to empty a wagon of its contents. The LMSCA continued working on the Third Open as well as fixing a corridor plate to Class 108 50599 ready for use at the weekend with the steam engine. 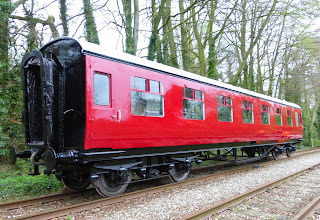 Work continued to brighten up the Pullman coaches externally too. The Booking Office was kept busy with all manner of enquires and a planning meeting was held with team trent barton to discuss progress on the preparations for the Big Bus and Train Bash on 10th May. This day certainly does promise to be something we have never tried before! Another beautiful day where Iris was called into emergency action to increase the number of cars operating the service. This was due, in part, to the weather as well as the school holidays. We also welcomed some visitors from the Weardale Railway who are admiring our enterprise as they restart heritage operations again soon as a new company. The yard saw another shunt today to alter the arrangement in the shed area. Nearby, the VCT continued the beautification of the headshunt area. The steam team progressed their maintenance of the locomotives and work progressed on the wagon at Ravenstor. Work progressed in changing the seats in the SK and some attention was turned to maintenance of the dumper truck. The LMSCA pottered about also, as did Fred and Iris who swept around the station and stained the flower pots wood. Sorry if anybody has been missed! A very pleasant day along the line today, we didn't deal with huge numbers but the steady routine is always satisfying. Down the yard the Austerity wheels became resplendent in gloss black and no doubt the rest of the locomotive will become equally resplendent in a very soon moment. Nearby, the LMSCA carried on with fitting a corridor end cover to the class 108. The DMU team carried on with the Formica work in unit 50253 as well as further fitting out of the cab. The Duty Conscript and his close personal friend, being assisted our own cadets and a deputation from the DMU team strove to cleanse the car park of its accumulated winter tat ready for the Easter weekend, and whilst this might sound a small task it took eight staff all day to achieve. Another wonderful day on Derbyshires friendly railway. The passenger service bobbled up and down and was slightly surprised by a large party of walkers at Duffield. In the yard the LMSCA painted the under fames and varnished the sides of the TO. They also fitted a tasteful corridor end to 50599. Not far away the 8f group carried on painting the Austerity. While another of their group worked on Kathryns boiler. The DMU team found themselves to be wiped out after finally fixing the troublesome wiper motor on 50253. A Lings improved heater duct was also fitted to this vehicle. Several members of this team covered themselves in glory (know round here as used oil) by cleaning out the pit for the first time since records began. A delightfully sunny spring day here in the Gem of the Peak. We entertained a number of steam and diesel driver experience guests and all went very well. Down the yard work proceeded in unit 50253 where Field Enterprises continued stripping, and nearby Perkins-Colledge painted some narrow gauge items ready for the new season. 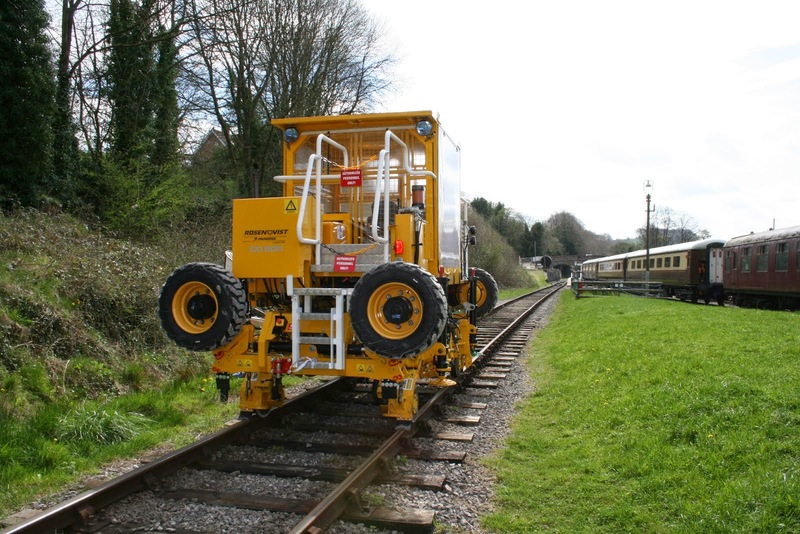 JCB Purves also continued with the painting of both the Cromford and High Peak Water Carrier and of the Passenger Manager. The Station Foreman had a day of shuttling and steps and the Booking Hall dealt with the opening of some warming envelopes. May I say a word of thanks to all our shareholders who are supporting the current appeal for funds to finish Shottle and start the works needed to make the Temporary Maintenance Facility ("Shed") a place which doesn't blow the circuit breakers when you turn the lights on. 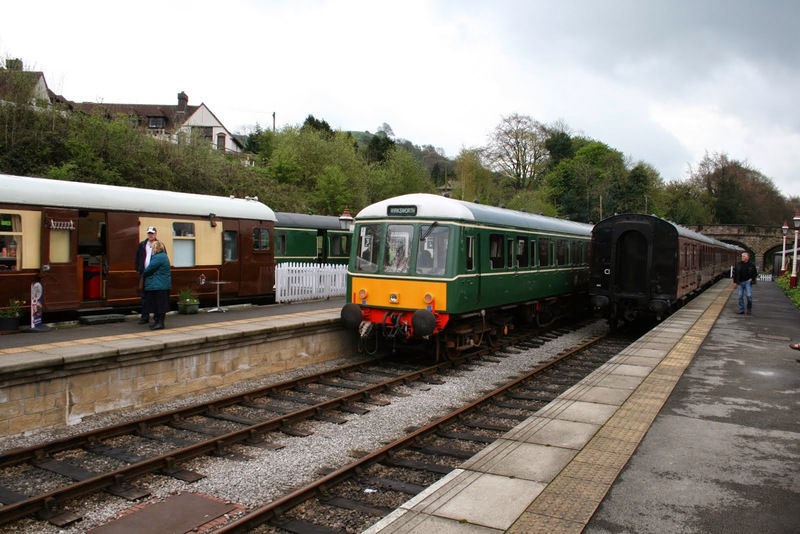 A dry and pleasant day with little pockets of activity around Wirksworth as we rush headlong into operating 10 of the next 15 days through the Easter holidays. At the most northerly point in the yard, the VCT continued their quest to tidy the vegetation in this area. Our testing teams were nearby completing their tests and ending their day with the machine leaving site. This enabled logs to be put into position for our customers to collect. Attention was once again turned to LJ Breeze to help sure up the clutch arrangement, with satisfactory results. 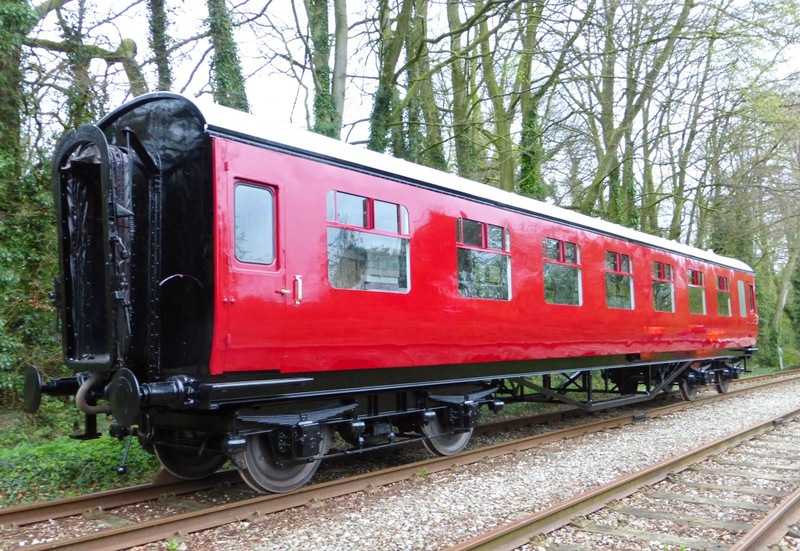 A small team worked on sprucing up the paintwork on the Pullman coaches which has weathered recently and a team worked on replacing the cushions in the SK. The Booking Office was kept busy by Amazon customers ringing to book Afternoon Tea and in between, was flinging messages backwards and forwards with trent barton to assist with plans for the Big Bus and Train Bash on 10th May. This event promises to be a brilliant one of special with all sorts going off. Check our their website at www.trentbarton.co.uk/bigbash for more details on this! A most productive day in the testing world with two customers on site, one of which is illustrated, who were well looked after by Mick Thomas and David Newby and I am grateful for their energy in making these valuable contributors to our enterprise welcome. 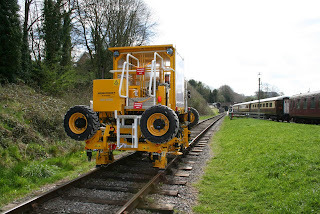 Richard Preedy prepared the Multicar for a weed treatment trip next week if the weather permits and hand sprayed around Wirksworth Station including the childrens play area and narrow gauge tunnel. The Head of Gardening was active and, with her own barrow, moved waste material to the burning site benefitting from yesterday's VCT fire activity. The Permanent Way Team travelled to the south end of Bournebrook Avenue where we have continual problems with the track geometry and have used their best endeavours to restore a smooth curve transition. Long, long ago there was a point installed in this area to provide a holding loop south of Gorsey Bank and the track, having a mind of its own, keeps trying to follow this course. 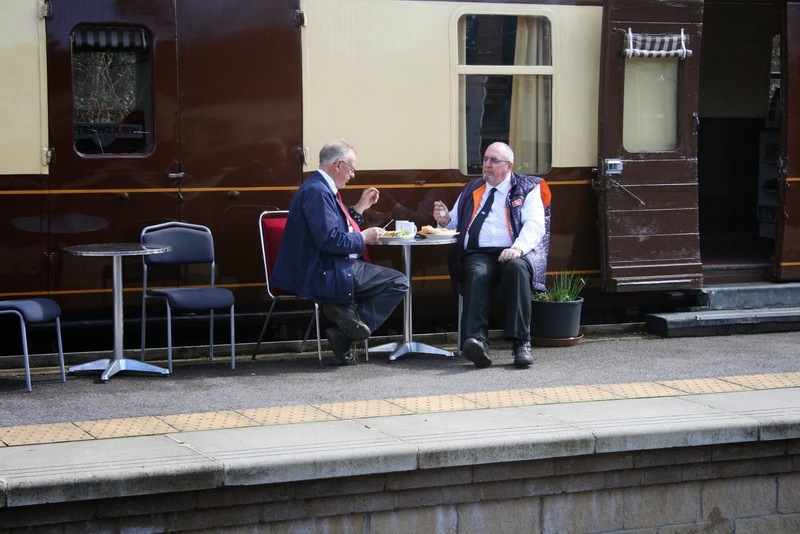 The Pullman Buffet Car benefitted from the number of test customers on site and the Booking Hall received more group bookings and Tuesday Afternoon Tea enquiries. The Amazon project has grown to over two hundred couples which uplifts all of us that we gave got something very right. My next few days will be spent enjoying "trenitalia" and "vaporetto" with many holiday photos and videos to delight you in a week or so!!! The VCT are featured today as they worked north of Cemetery Lane at the very end of our line to open up the area to natural light that will work towards drying out a very wet part of our empire. When we arrived on site way back in 2000 this part of our line was impassable due to the density of the undergrowth and we work towards making it a useable area of our Railway which, hopefully, will eventually host a carriage shed. Six men on site and one large fire. Track Patrols toured the whole line and the DST tended to the horn guides and brake rigging on Cathryn. Further progress was made towards the fitting of Henry Ellison with steam heating capabilities. Fred & Iris gave the Mess Hall a good clean and the dmu team sealed the roof ventilators on 50253. At Shottle the SBT reported distressed limbs after they had shovelled and barrowed some 10 tonnes of donated "plantings" as they build up the fill of the platform. Some 9 inches of extra height is required which they hope will benefit from further supplies with the downside that this will all require barrowing to site. The team also appeal for a loan of a petrol "wacker plate" of either 2ft or 2ft 6ins square dimensions if anyone has one resting in their garage or store. Today's service trains were very well supported and conveyed, without their knowledge, two great supporters of our enterprise, Cliff & Gwen Fraser, who had a pleasant surprise for the Capital Project Fund after their journey. Cliff and Gwen were extremely generous when we were seeking funds to buy the Komatsu which has proved itself so useful over the last few years. The miniature railway was in operation through the day with a variety of new motive power and FF2 continued with our quest to be squeaky clean with the documentation. The Booking Hall had a most productive day of sales in person and on line. The Pullman Buffet Car team, in addition to catering for our service passengers, dealt with the very first clients of our Afternoon Tea and Train product. They were apprehensive as the initial 4 booked turned into 6 overnight and then to 8 some 12 hours ago. As this is quite an upmarket offer the components have to be specially sourced but they passed the test with flying colours and my thanks go to them for rising to the challenge. Amazon sales are approaching 180 couples which will have a significant effect on our fortunes and it is a delight that we have delivered the first one so well. PS Angela's husband John's funeral will be held at Derby Crematorium next Tuesday at 1440hrs. I am sure she would welcome any support from our team. A rather chilly start saw the first train of the day surprisingly busy and various visitors pottering round for the rest of the day. At Duffield work was taking place with benches and signs. Back at base the Austerity was having its frames and wheels painted, a process likely to take a while longer, and the theme of paint continued in the shed with the first coat of varnish being applied to the Third Open. JCB Purves spent the afternoon moving gravel and work continued in the steam pit, the EVRA carriages and in the SK, which is gradually receiving new upholstery compartment by compartment. welding up holes in the floor, screwing in the cab, fixing the fire alarm covers and glueing tasteful new woodgrain Formica to anything that moved and several things that didn't. I suspect another astonishing DMU refurb will be unveiled upon us in a very soon moment. A steady day on Derbyshires friendly railway as the 122 bubble car 55012 looked after the Wirksworth to Duffield service and Iris the railcar looked after the Ravenstor Service. Down the yard the LMSCA worked hard to finish off the painting of the third open doors ready for starting the varnishing tomorrow as well as steaming of ash roof struts. The Dmu team carried out further restoration of the 101 50253 , the servicing of the 119 as well as working to fix LJ Breezes fuel leak . Oakes enterprises prepared and painted the frames of the Duke . Another successful Induction and PTS course was held this afternoon in the training room and we would like to welcome several potential members of staff to the railway. All in all a pleasant day was had by all and I would like to thank Richard , John Allsop , Vince , Eric and John Jarman for providing todays service. A rather pleasant day of unusual activity for a Friday. We had the pleasure of both steam and diesel experience guests as well as some testing, fitted in between trains. In the shed the LMSCA carried on with the joy of the Third Open, about to emerge in its full colour version. The Station Foremen, never knowingly users of fresh items, recovered various pre-used materials for a top secret project as well as stopping the public falling off the top step of the Booking Hall. The Booking Hall, overcome with joy at its new sales gondola, fitted it out with assorted goods for the delectation of the public, a process only interrupted by calls for Afternoon Teas at shockingly regular intervals. It's amazing that the space time continuum does shift dates about. It has been a dull dank day with a taste of a return to winter. If sand is being shipped at high level from the Sahara it should be at least warm! The dmu team puzzled over L J Breeze's disgrace yesterday and with their ace, Graham, seem to have detected and rectified the problem which lead to the planned stock moved being achieved by this locomotive. The movements were designed to ready us for tomorrow's diesel and steam experience days. 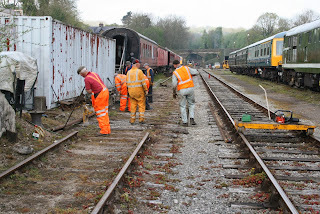 The team also began to prepare the LMS Brakevan for a new roofing which involved removing numerous felt tacks that had been left behind when the old felt blew off in the winter gales. The VCT continued with their mountain goat activities north of Cemetery Lane which we hope will assist this area finally drying out and the Pullman Buffet Car had quite a busy day from visitors and staff. The Booking Hall was again assailed by phone calls from Amazon customers for the Afternoon Tea and Train product with the total so far reaching a spectacular 103 bookings. This along with the on line sale of two bronze diesel experiences made for a most productive day. 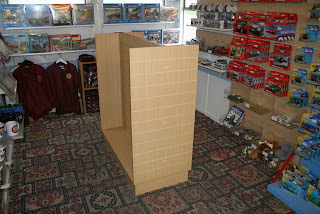 The new flat pack sales island arrived and was assembled as shown in today's photo. Retail sales have blossomed this year with the re-configuration and redecoration of the Booking Hall with today's addition making further progress in this area possible. The phone has never stopped today after Tom's deal with Amazon for our Tuesday Afternoon Tea and Train went live with 50+ bookings taken in the first few hours. A very real lesson in what really sells in this multi media world. Day one equates to over £1500 of revenue to our enterprise. 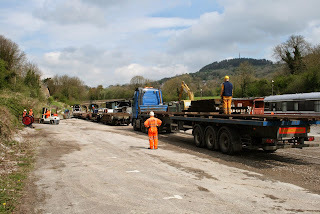 The PWT had a most frustrating day as the plan to deal with a range of tasks at Shottle and down the line was killed by the failure of L J Breeze at Gorsey Bank resulting in an unconventional rescue by the Komatsu. Nonetheless, they managed to turn their attentions to the relocated fuel store and clean up the recovered pointwork from the north of Cemetery Lane bridge. They were joined by Bertie from the Ecclesbourne School and his teacher who will be with us on Wednesdays for the foreseeable future if all works well. The average age of the team has been significantly reduced by these additions. There was activity to renovate the Cromford and High Peak Railway water tank which is the oldest vehicle on our Railway dating from the 1890s and had a significant part in the history of our area. 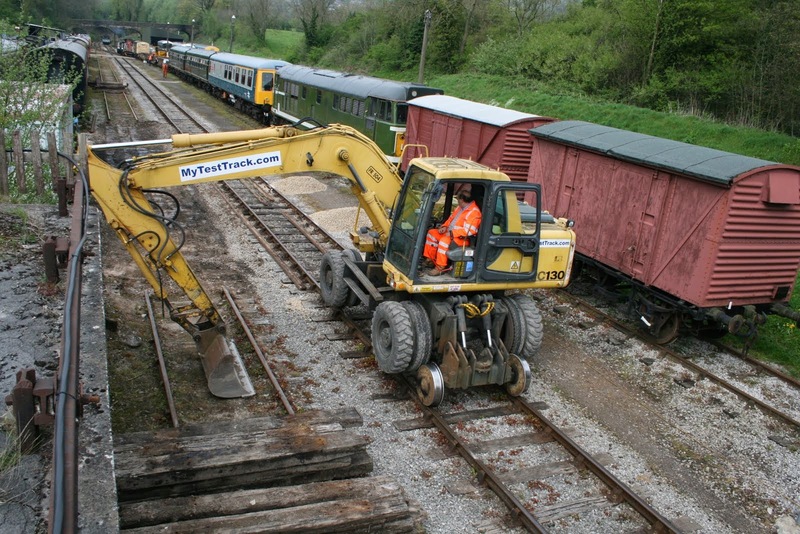 The SBT are striding on with the refurbishment of the platform with a combination of sleepers and curb stones being laid to prepare for future tarmacing. The LMSCA are reaching a pleasant conclusion to the exterior painting that accompanies the refurbishment of their Third Open. Today's photo tries to capture something of the finish being achieved. The Pullman Buffet Car had quite a thin day which was dank and grey after yesterday's Spring like conditions. We welcomed our "walking stick" customer who put four pieces of apparatus thought their paces. 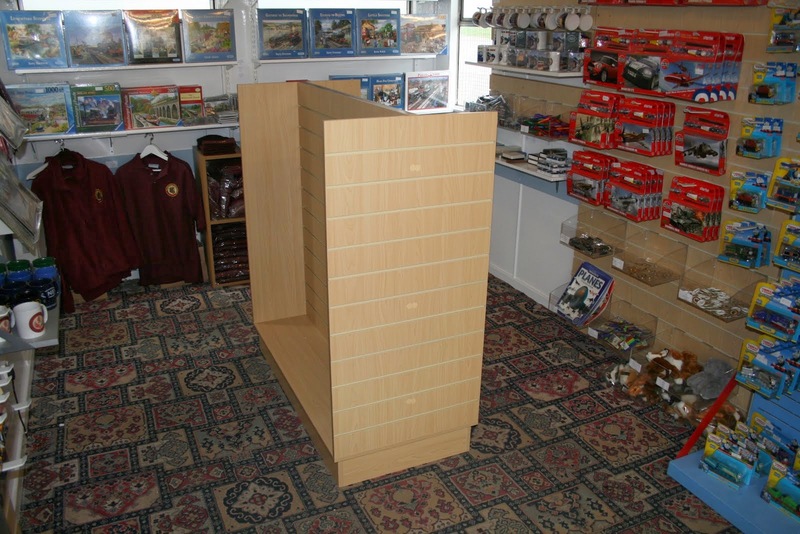 The Booking Hall, as previously mentioned, was overwhelmed by Amazon but also dealt with many other enquiries and is looking forward to another element of the retail display arriving tomorrow. Today was our first service Tuesday and the team swung into action to welcome our passengers. Two of today's team are seen dealing with today's pressures in the pleasant Spring time warmth. Fred and Iris returned to their task of cleansing the Mess Hall which, I hope, is beginning to be realised by those volunteers that make use of the facility although the donation of milk seems to defeat most of the team. The dmu group tended to the electrics on the Met-Cam centre car and the DST reduced Cathryn to further parts involving the main frame and horn guides. The disassembling and renovation will ensure when the loco is put back together it will be as new. The other part of the DST reports great progress with the fitting of the ability to steam heat to Henry Ellison. All part of the master plan for the future. 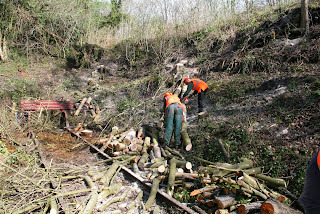 The VCT have been tackling the difficult area north of Cemetery Lane bridge where they had to have the skills of mountain goats but with six men and the creation of two fire they are making steady progress. They did report that they have discovered early cave dwellings with some suspicious burnt bones that indicted an earlier prehistoric version of the VCT. The PWT completed the demolition of the fuel tank area and removal of the two tanks there. Construction of an alternative site for the fuel tank took shape and a Lowmac was emptied of timbers ready for its next role. The PWT also benefitted from the "Sage of Devon" with a brief welcome return of Phil Tarry whose humour hasn't improved by his absence - but we love him! The M1M approached the completion of the new wiring one of the EVRA coaches and the SBT had a very productive day with sleepers located for the future flower bed area and the installation of kerb stones outside the station building. The LMSCA installed the bump stops for the refitted doors on their Third Open, steamed some more roof sticks and completed a coat of gloss black on the guttering. Anne looked after the Pullman Buffet Car in circumstances outlined below which was coupled with Martin, the chef, learning that his father had been taken into hospital with a heart attack. Some extremely sad news reached us this morning which affected Angela as she arrived with us. Her husband, John, had died at the wheel of his lorry delivering a load into East London. Despite valiant efforts he was declared dead at Romford Hospital. I am sure everyone will wish me to give Angela our sincere and heartfelt sympathy in what must be the most difficult time in her life.